I heard a documentary on the Radio 4 describing the flight patterns or ‘murmurations’ of starlings, and featured the amazing whispering crescendos of noise created by their massed roosting. I remembered watching these formations on TV and my sense of vertigo that accompanied their complex flocking. I became mesmerised by their flawless flight and the synchronised turns and swoops as well as the inter-relatedness of their movements. My interest in the individual as part of a whole and how to express that had found a new figurehead – the Starling. I respond strongly to ideas of internalising landscape, or re-creating an aspect of topography or climate. 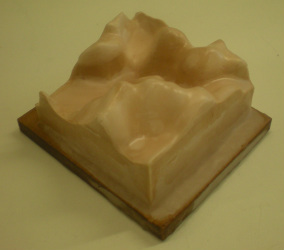 in this project, I created a scale, 3D map of the Lake District in plaster, and from that, selected certain areas. Having done that, I created smaller, souvenir-sized cubes in resin and wax, detailing the valleys and peaks of the Scafell Pike range, having climbed it with my children.